It will take some time to fully assess the impact, he said. “I’m not aware of large-scale building collapses, but I think it’s safe to say there are thousands of homes and businesses and buildings that were damaged in some fashion, be it a deck that slid downhill, a cracked foundation, a gas line disconnected from the house,” he said during a Facebook Live interview. The magnitude 7.0 quake struck 7 miles north of Anchorage, about 30 miles underground. It was detected by seismic instruments across the planet, he said. “We’ll see these waves ripple around the world for a long time,” he told a reporter. As of Friday evening, the event had triggered about half a dozen “significant” aftershocks greater than magnitude 4.5 and many more smaller ones. More aftershocks, generally diminishing in strength, are expected to continue for months, he said. 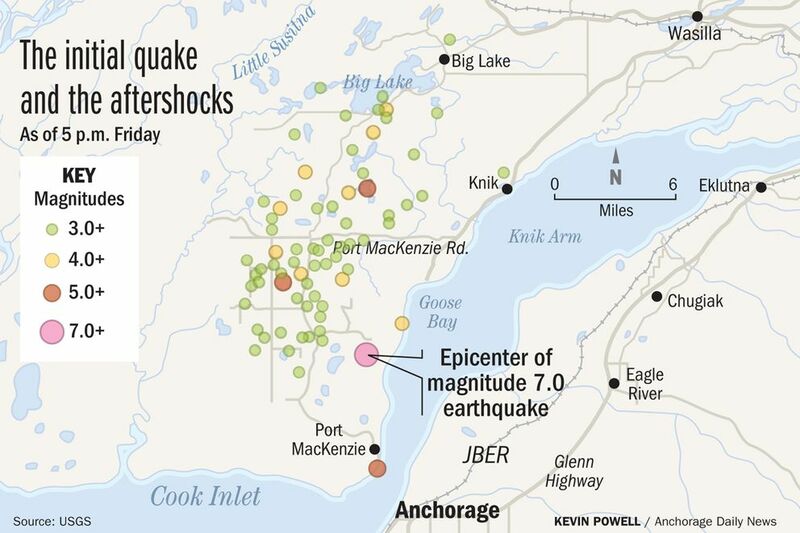 The shaking in Anchorage lasted less than a minute, or more, depending who you asked. It led to rumors in “social media land" that a bigger quake was imminent, West said on the Alaska Earthquake Center Twitter page. West said he worked to “smack down” that misinformation, calling it highly unlikely in his Twitter post. About two dozen motion sensors across Anchorage show the earthquake was the most powerful one felt in the city since the deadly magnitude 9.2 quake in ’64, West said. 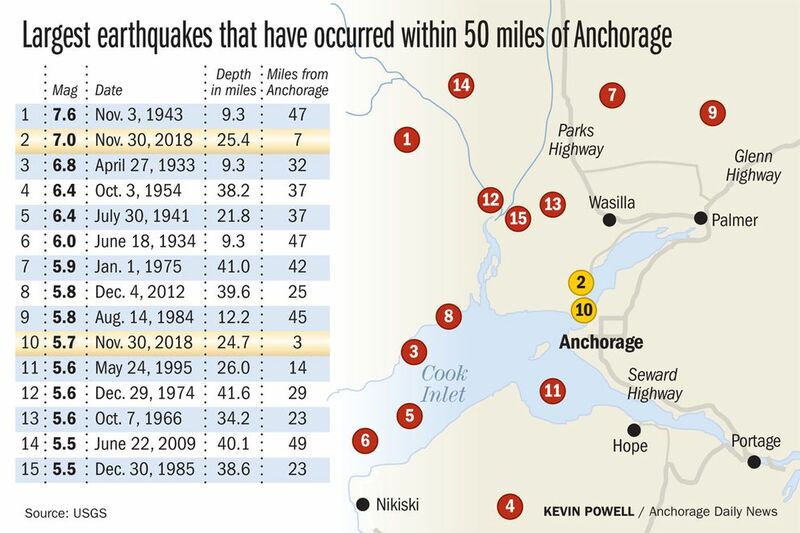 Friday’s Anchorage earthquake generated sensor readings across the city consistently higher than 25% g – or shaking that is about 25 percent as strong as the normal acceleration of gravity, he said. The next strongest temblor recorded by those sensors, which weren’t in place in 1964, occurred during the Iniskin Earthquake in January 2016, he said. That magnitude 7.1 earthquake was felt sharply throughout the Anchorage area. But it jolted the city with much less energy than Friday’s Anchorage earthquake because it was about 160 miles away, not “next door” to Anchorage, he said. It was also deeper underground, at a depth of about 75 miles. Still, the 2016 and 2018 quakes are similar in important ways, he said. Both were marked by sharp, vigorous shakes, rather than the long, sea-like rolling described in the ’64 quake. Both also occurred in a "subducting slab” pulled into the earth beneath southern Alaska, he said. The rupture Friday, about 30 miles underground, lasted maybe 10 to 20 seconds, also similar to the 2016 quake, he said. The rupture likely extends more than 10 miles long. West, who lives in Fairbanks, said he heard from numerous colleagues who were “very scared” by the Anchorage earthquake’s sharp jolting. And those are people well acquainted with the power of earthquakes. “What happened in Anchorage was an emotionally disturbing event,” West said. The quake was a warning of sorts that the damage could have been far worse, and people should be prepared for future, big temblors. “Anyone who felt the strong shaking this morning has more of a reminder ... than we will ever be able to put out as public service announcement,” he said.